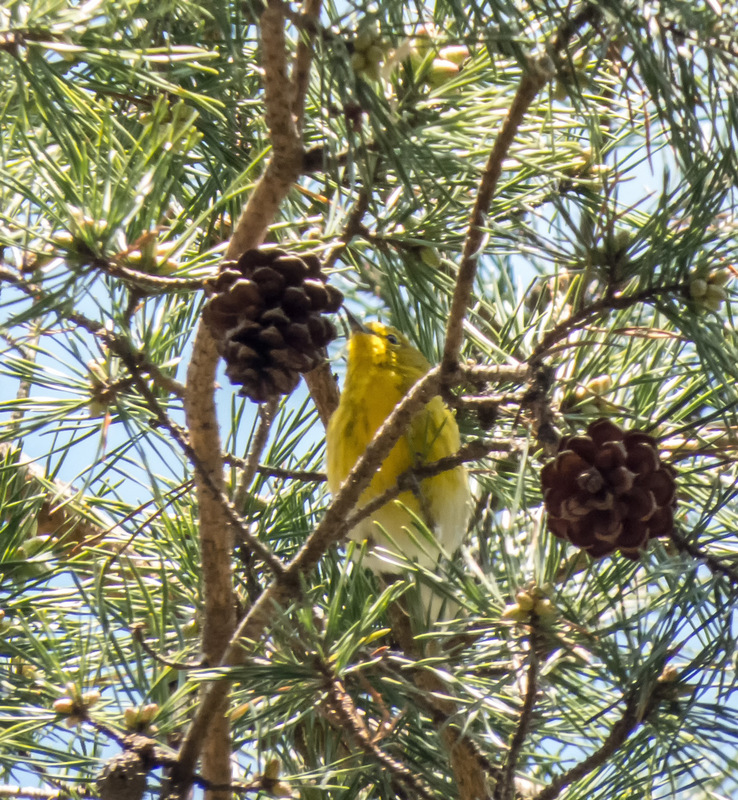 As I was exploring Accotink Bay Wildlife Refuge earlier this week, I spotted an unusual shape in a small tree. I moved a little closer and zoomed in with my camera and discovered that it was a fairly large animal. It was bigger than a squirrel, so my initial thought was that it was a raccoon or an opossum, but as I studied my viewfinder, I quickly rejected those possibilities. What was the animal? When I uploaded the images to my computer, the facial features reminded me of a beaver, but the visible portions of the animal’s tail look to be hairy, so I eliminated both the beaver and the muskrat. Grasping at straws, I started looking at photos of porcupines, but they didn’t match at all what I was seeing in the photo. 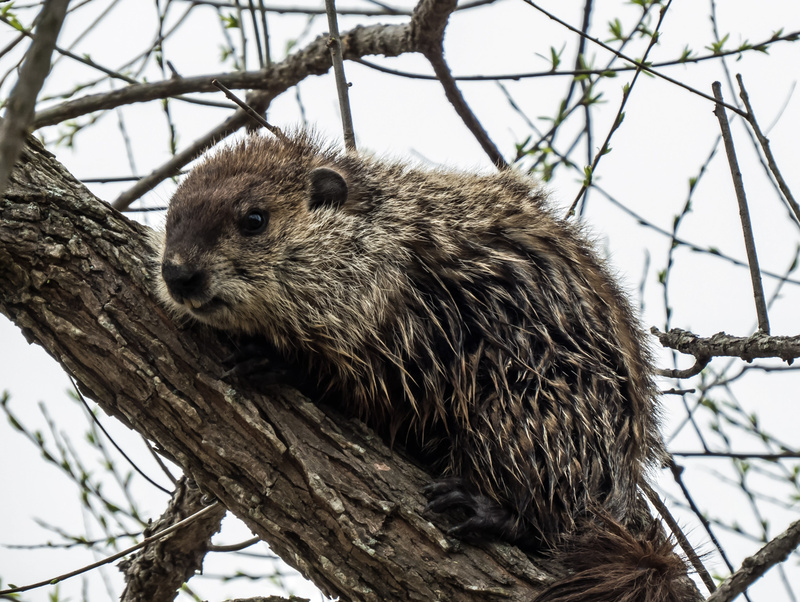 Finally I came across some photos of a Groundhog (Marmota monax) and I realized that I had finally found a match. On the same day that I saw the Common Whitetail dragonfly that I featured yesterday in my blog posting, I was thrilled to have the chance to photograph an uncommon dragonfly, a male Stream Cruiser (Didymops transversa). I had never before seen a Stream Cruiser, but local dragonfly expert and fellow photographer Walter Sanford had observed them in the past at Accotink Bay Wildlife Refuge and offered to guide me. It’s somewhat of an understatement to say that Stream Cruisers are hard to spot. The are not very big (about 2.2 inches (56-60mm) in length), they are skittish, and they often perch on the stems of low vegetation. During the hours that we searched for them, I observed a couple of probable Stream Cruisers in the air, but lost them in the blur of the vegetation and never saw a single one land. Walter saw the first one of the day, a female, and posted an awesome photograph of the beautiful dragonfly in a blog posting yesterday. Unfortunately for me, I was unable to make it to the dragonfly’s location before she flew away. Walter spotted a few more Stream Cruisers during the day, but each time I couldn’t get there quickly enough to see one. I was beginning to think that I was going to end up empty-handed for the day when Walter called out that he had spotted a male perched in the underbrush. 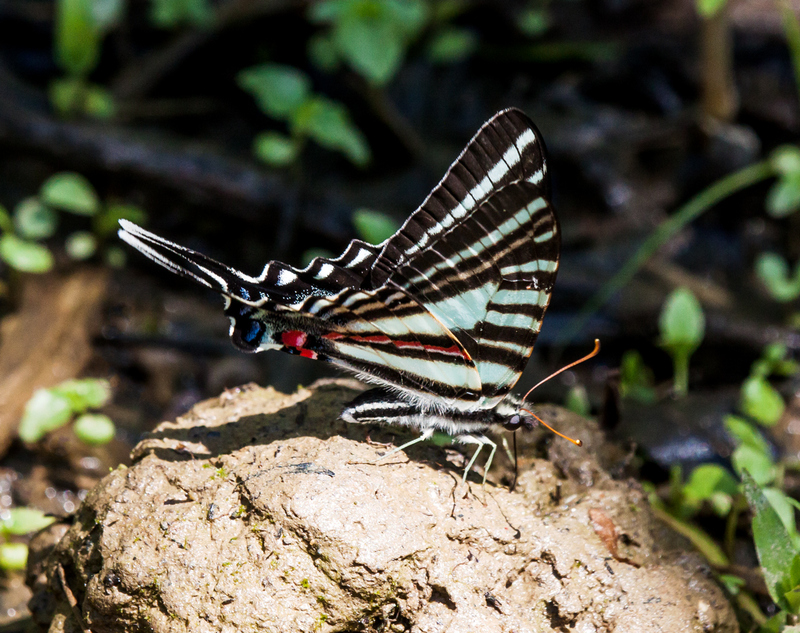 This Stream Cruiser was cooperative enough to stay perched as I rushed to try to get a shot. 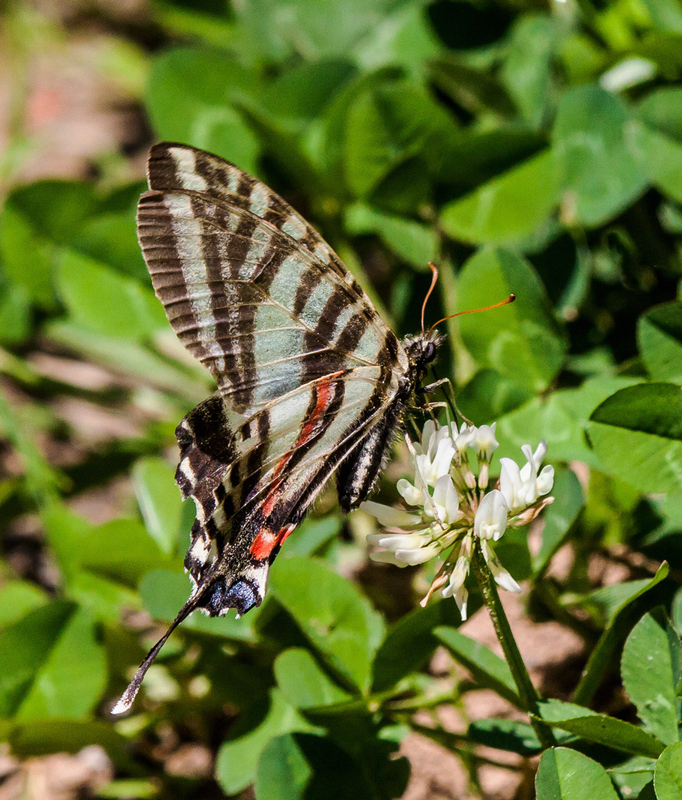 I had my Tamron 180mm macro lens on my camera at that moment. The dragonfly and the stem on which it was perched were so small in the viewfinder that my camera’s autofocus would not lock on my subject, so I had to resort to focusing manually. 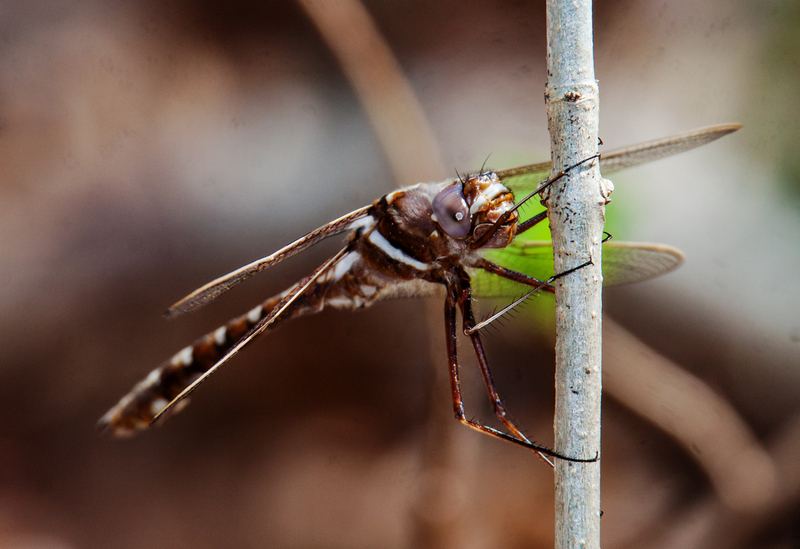 Dragonflies have so many fine details that it is really hard to tell when they are in focus. This image was the best I could get after cropping the initial shot quite a bit. I decided to push my luck and see if I could get a better shot with my Tamron 150-600mm lens that I use primarily to photograph birds. Amazingly the dragonfly stayed put while I changed lenses. Once again I had to focus manually, which is an even bigger problem with this lens, because the focus ring is located really close to the lens mount. It’s hard to hold the camera steady and focus manually at the same time. Here’s an image that I shot at 600mm. I managed to get the eye pretty sharp and to capture some of the details of the dragonfly’s incredibly long legs, but the depth of field was so shallow that the abdomen is out of focus. Normally I will try to move around the subject to be as parallel as I can be, but in this case I stayed fixed at one spot and remained as immobile as I could. It is really nice to start off this dragonfly season with a new species. 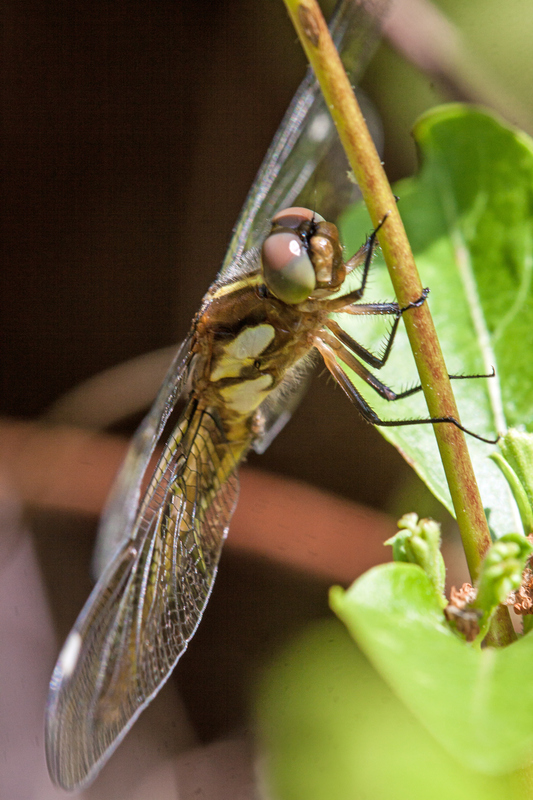 If you want to learn more about the Stream Cruiser dragonfly, check out this page from the Dragonflies of Northern Virginia website (and stay tuned for Walter’s shots of this dragonfly that should appear tomorrow morning in his blog). 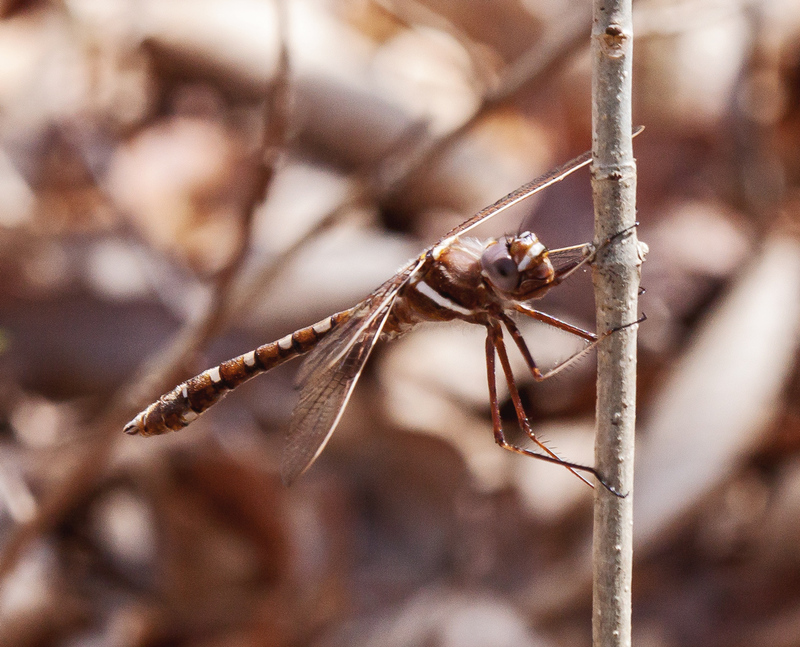 Thanks to recent warmer weather, dragonflies are finally starting to emerge in Northern Virginia. I captured this image of a female Common Whitetail dragonfly (Plathemis lydia) on Monday at Accotink Bay Wildlife Refuge. 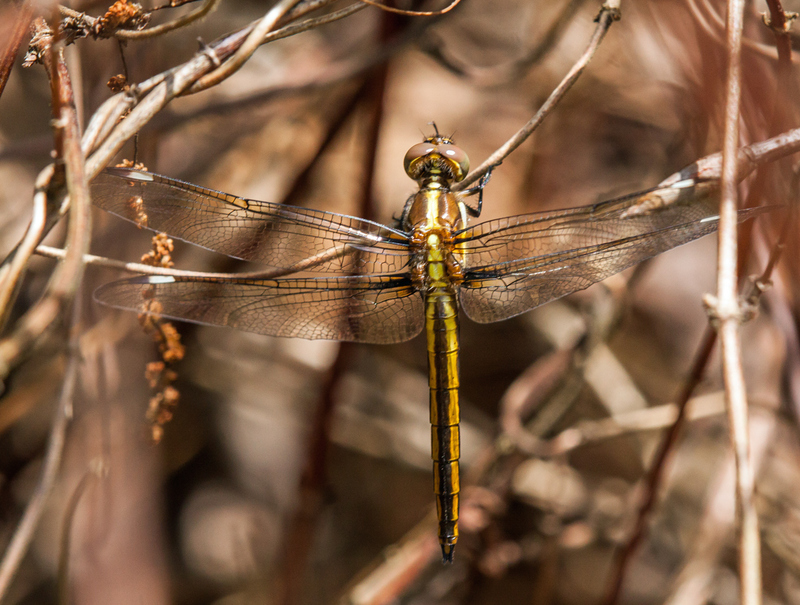 Unlike many species with the word “common” in their names, Common Whitetail dragonflies are actually pretty common. 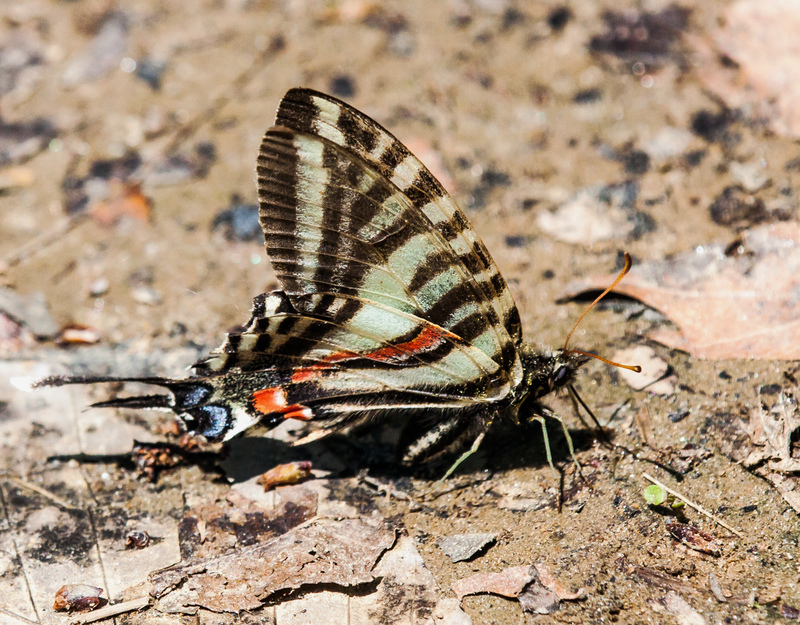 They are among the first species to emerge in the spring and among the last to depart in the fall. 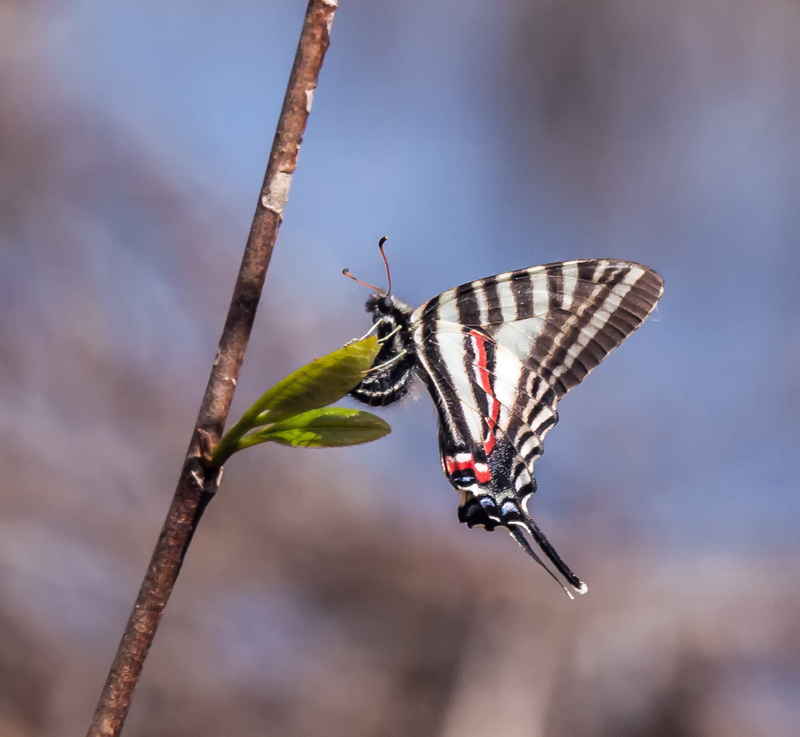 Unlike many of the early spring species, they are habitat generalists—you can find them pretty much anywhere and do not have the scour the underbrush or walk through streams in remote locations. Although I spotted a Common Green Darner dragonfly earlier this month, I was not able to get a photo of it and suspect that it had migrated from another location. This is my first photo of the season of a “native” dragonfly, with plenty more sure to follow in the coming months. 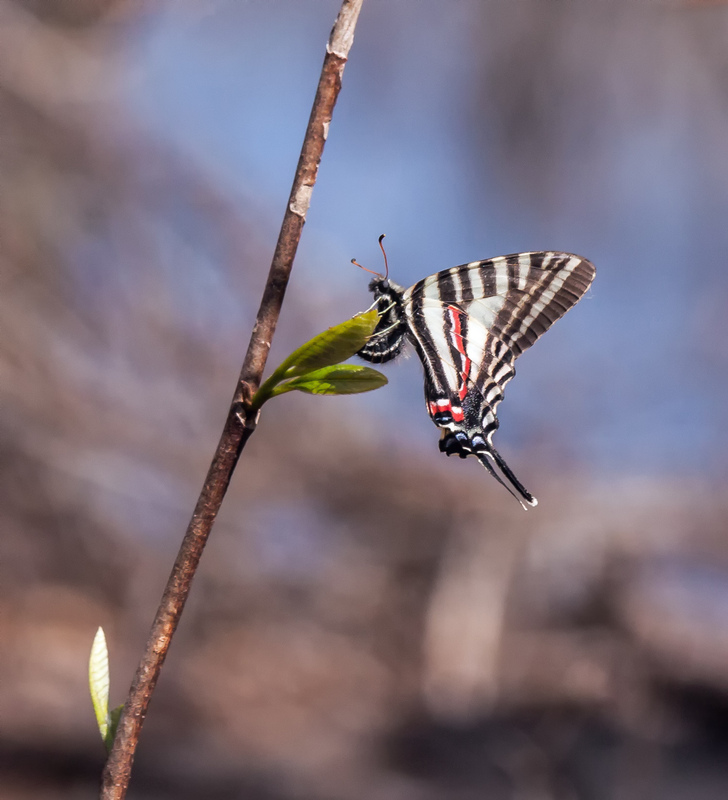 It’s dragonfly season and this past Friday fellow dragonfly enthusiast and photographer Walter Sanford guided me to a new spot to search for the elusive beauties. Accotink Bay Wildlife Refuge is a nature preserve located on Fort Belvoir, a nearby military base in Fairfax County, Virginia. 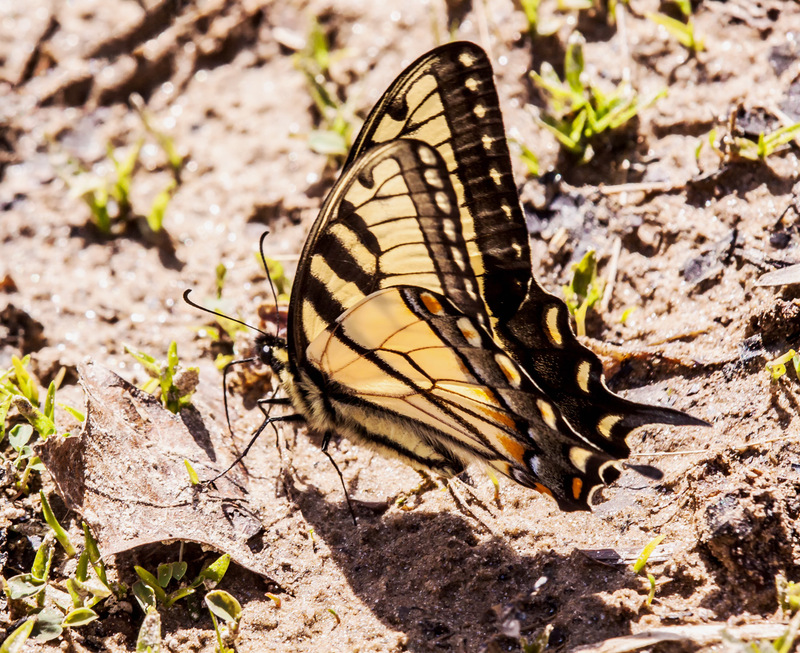 We are in a lull period of sorts for dragonflies—some of the early dragonflies are gone and others have not yet appeared. As we were making one final swing through likely locations, having come up almost empty-handed in our search, Walter spotted a dragonfly. 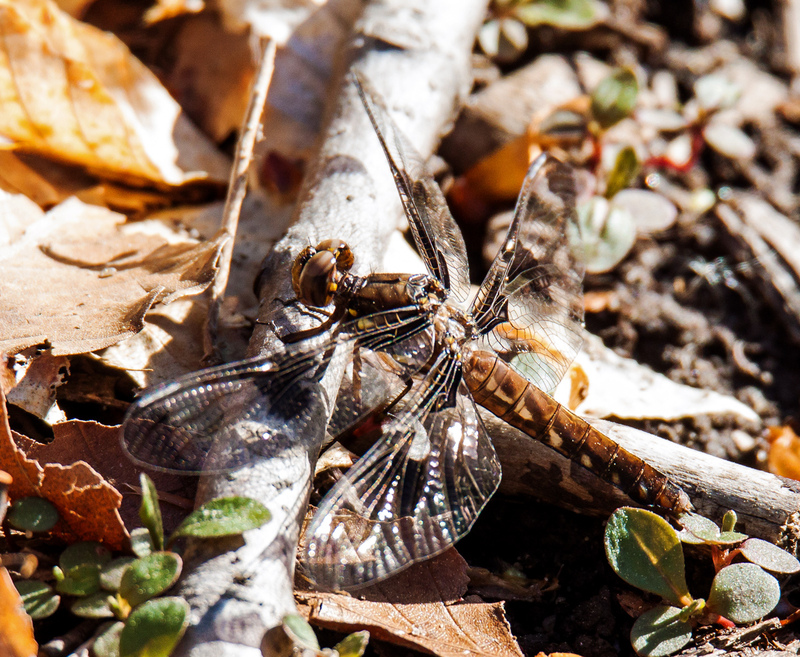 The wings were so clear and shiny that it was obviously a teneral dragonfly, one that had only recently emerged. Identification (and photography) was a bit of a challenge, because the young dragonfly was perched inside of a tangled mass of vegetation, making it almost impossible to get an unobstructed view. Eventually we were able to find a visual tunnel and I was able to get the first shot below. It gives a pretty good view of the dragonfly, which after the fact I could clearly see is a Spangled Skimmer (Libellula cyanea), but I really wasn’t satisfied with it. Eventually I managed to get a second shot. It doesn’t show the dragonfly’s entire body and many element are out of focus, but it has an artistic sense that I find really appealing. I’m not sure if it’s because of the more vibrant colors or the unusual angle—I just know I like that image a whole lot more than the first one.